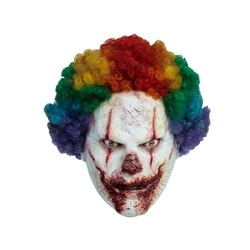 The Clown Horror Mask is an officially licensed mask from the 2014 film Clown directed by Jon Watts. Clown tells the story of a man who dons a clown costume and can’t take it off. The man begins to change, and experience dark desires. Do you dare to wear the Clown Horror Mask this Halloween?